Helquist, Brett. Very Good. 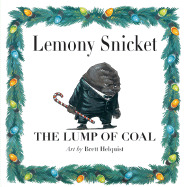 The Lump Of Coal by Snicket, Lemony, 2008-11-01. Sewn binding. Paper over boards. With dust jacket. 32 p. Contains: Illustrations, color. Intended for a juvenile audience. This is a great little book with the unusual humor that you would expect from Lemony Snicket. The illustrations are great, too. I think older kids and adults will appreciate this book better than younger ones.